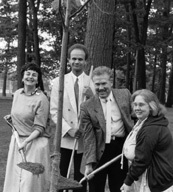 Members of the Ward 9 Sesquicentennial Committee plant a commemorative tree in Kew Gardens south of the Gardener’s Cottage. From left: Sheila Blinoff, Tom Jakobek, Don Snider and Anne Kovasci. In 1984 this paper entered its 13th year. The editor Joan Latimer described it as truly a community paper. Many struggling causes had become a success once their plight was mentioned in our 23,000 copies. People from outside the area had asked for delivery. The paper went out to reading clinics all over the city where it was used as an educational aid. Readers liked the homey feeling generated by the paper. “We must be doing something right,” Joan said. In June a new board of directors was elected. Linda Greer became president, with Tom Howat as VP, Barbara Phillips as secretary, and Gord James as treasurer. Geoff Jarvis became past president. Carole the Cook joined Allan O’ Marra the arts columnist, Sandra Beattie the fitness guru, Louise Tracz the vet, the East Toronto Community Legal Services, cartoonist Bill Suddick, local librarians Barbara Weissmann and Susan Wickham, and Ellen Duchesne who interviewed celebrities. Carole Wilson recently recalled how she came to have a regular recipe feature. She talked to other mothers in the Balmy Beach School yard and found that what women really wanted was fast cooking not fast foods. She began sharing her ideas with our readers who were soon supping on her Baked Cheese with Shrimp, Paella, and Turkey Creole. This was the year a new word entered our vocabularies – Sesquicentennial. The old city of Toronto was 150 years old, and in each ward a committee organized celebrations. In Ward 9 the local ‘Sesqui’ committee included local councillor Tom Jakobek, Anne Kovasci, Hilary Rowland, Ann Doherty, Gene Domagala, Don Snider, Sheila Blinoff, Winona Gallop, and Des Conacher. Local events included an ice sculpting contest and celebrity skate winterfest in Kew Gardens, a gala with guests dressed in 1834 costumes in the Greenwood Racetrack banquet hall, a parade and picnic on the Ted Reeve grounds, the unveiling a plaque on the site of the old Norway Post Office at 320 Kingston Rd., and the planting of a white pine in the Glen Stewart Ravine. Over 90 women and men, under the leadership of Hilary Rowland, stitched the Ward 9 Sesquicentennial Quilt which now hangs upstairs in the Main Street Library. The theme in its 35 squares was ‘What this neighbourhood means to me’, and if you go to the Main Street Library you’ll see interpretations of St. Aidan’s and other local churches, the Herbert Street Firehall, the Malvern band led by George McCrea, the front page of Ward 9 News, the baseball diamond in Kew Gardens, the boardwalk, a flower shop on the Danforth, etc. On June 10, 8,000 people from 16 local churches and the Beach Synagogue gathered for a Sesqui celebration of faith on the grounds of the Greenwood Racetrack. Two local congregations amalgamated. Glenmount United at Gerrard and Golfview joined with Rhodes Avenue United at Gerrard and Coxwell to become Glen Rhodes United Church which uses the Rhodes Avenue building. The Glenmount property is now the home of the Grant African Methodist Episcopal Church. On Jan. 5, one of North America’s top paddlers from the 1920s died. Roy Nurse won three gold medals at the Paris Olympics in 1924, and was a member of the Canadian Amateur Hall of Fame. Nurse, 81, was born in the Beach and began paddling as a teenager at the Balmy Beach Club. By 1922 he was good enough to win the Canadian Canoeing Championship, a title he defended successfully for over a decade. The street where he lived at the end of the Queen streetcar line was renamed Nursewood Road in his honour. Lord Athol Layton, the 6’ 5”, 270 lbs wrestler who lived on Pine Crescent died on Jan. 18. Athol, 63, who came from Australia where he was an amateur boxing champion, became well known in wrestling circles here until he retired because of an eye injury. He was awarded the Ontario Medal of Good Citizenship in recognition of his volunteer work on behalf of handicapped and under privileged children. Just after midnight on June 4, 10 hardy souls slid a Northland canoe into the waters at Fort Niagara in New York State and paddled across the lake. By mid afternoon they came ashore at Woodbine beach. This was Community Centre 55’s first annual Great Lake Canoe Race to raise funds for the centre. This first crew, which trained for over three months, included Lin Grist, Bob Murdoch, Chris Murdoch, Gord Moore, Tom Jakobek, John Fyfe, Sally Hart, David Jacobsen and City TV’s Jim McKenny. The movie Youngblood, starring Rob Lowe, was shot at Ted Reeve Arena, and local actor Ted Nicoloff had a small role. Over on Fallingbrook Road in the large white house at the corner of Queen, scenes were filmed for Evergreen, staring Leslie Ann Warren and Armand Assante. Windsor Avenue was blocked off while part of Reckless Disregard was shot. The Man From Glad was seen hauling garbage bags down the steps of house on lower Blantyre. At a Toronto School Board track meet, Glen Ames student Geoff Greaves, 13, of Cedar Avenue finished first in the Toronto senior schools’ 3000 metres, and set a new record of 11.58 minutes, beating the previous record of 12 minutes. Larry Hayes held his fifth annual fundraiser for charity. Over 100 people paid for standing room only in a hot tub on the back deck of his Kingston Road home. For reasons Hayes declined to explain, women paid only $15 while it cost men $20 for the experience. His next fundraiser that year was a jaunt through the beach on a 1928 Peter Witt streetcar. At the CIBC at Kingston and Balsam, a man shoved a note at the teller which read, “I’ve got a gun. Relax. Give me your money.” Instead she put a closed sign in front of her wicket and the man walked away. A Tory victory swept the country on Sept. 4, but the wave missed the Beaches riding. NDP incumbent Neil Young was returned with 15,258 votes, followed by PC candidate Jack Jones with 12,431. Monarch Park Collegiate held a 20th year reunion. The Main-Gerrard Coop had a 10th birthday party. Stephenson House, a group home administered by Senior Link for 10 frail elderly residents, opened on June 3 in the Danforth and Main area. A little theatre group led by Betty McGuire and Kate Philipps began at Community Centre 55. They called themselves The Main Attraction.